Pat S., 3rd, Single Speed, Lost Trail CX. 30 Dec 2012 - Osceola Velo Club's Pat Schlager scores another top-10 finish in the Single-Speed Category in the Grote Prijs Shawnee held at Herman Laird Park, Shawnee, KS. This was the 6th race in the 7-race Series60CX series which is held in and around Kansas City. The course was frozen and slick for the earlier races of the day but warmed up to become muddy and slick later on. Here are a couple of photo links of Pat precariously negotioting a couple of slick 180-degree turns in his race -- photo 1, photo 2. 16 Dec 2012 - Podium for Pat! 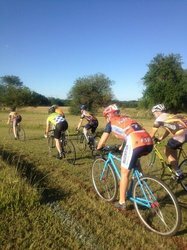 That's right, Osceola Velo Club's Pat Schlager finished 3rd in the Single-Speed Category at the Lost Trail Cyclo-Cross race held just east of Louisburg, KS. Conditions were the most "'cross-like" of any race so far this season -- cold (mid 30's), foggy, damp, with some mud. Here is a photo link of Pat rounding the muddy corner approaching the muddy run-up. 08 Dec 2012 - Osceola Velo Club's Pat Schlager raced in the Kansas State Cyclo-Cross Championships held at the Hummer Sports Park in Topeka, KS. 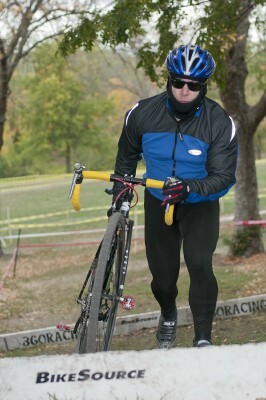 Pat S. braved the cold and cloudy early December weather to finish 10th in the Single-Speed Category. The State Championships wrapped up the 10-race KBCXR series with Pat finishing in 6th place overall in Single Speed for the season. Way to go, Pat! Here are some photo links of Pat at the State Championships -- cruising along the "Mound of Mercy" just before the steep downhill/180/uphill combo, snaking through the trees on the northern part of the course, and making the steep run-up up the "Mound of Mercy." 25 Nov 2012 - Osceola Velo Club's Pat Schlager raced at the Epic Holiday 'Cross over on the Missouri-side near Parkville. This race was the 4th race in the 7-race Series 60 CX series. Pat S. finished 6th in the Single-Speed Category on a very bumpy, though rather flat course. 10 Nov 2012 - Osceola Velo Club's Pat Schlager raced in the Grand Prix HPT, this season's only avondcross (that's "evening 'cross" for those of you who don't speak Flemish), held at the Heartland Park Topeka motorsport complex on and around the dirt track. The course included two sections of stairs, the banked dirt race track, a very bumpy section on the west side, floodlights, and wind -- lots and lots of wind! Pat S. finished in 5th place (16 KBCXR points) in the Single-Speed Category which bumps Pat up into 4th place overall for the season-long KBCXR series with only one more race to go. 04 Nov 2012 - Another full weekend of cyclo-cross racing for Osceola Velo Club's Pat Schlager at Stump Park in Shawnee, KS with the Colavita Cup on Saturday and the Boulevard Cup on Sunday. Pat S. finished in 9th place each day in the Single-Speed category on two (nearly) different race courses, so that's 16 more KBCXR points for Pat for a season total of 67 which should keep him solidly in the top-ten for Single-Speed. 21 Oct 2012 - Osceola Velo Club's Pat Schlager raced both days in the Joules Cross held at the Schwada cyclo-cross field just NW of Lawrence, KS. Pat S. finished in 6th place Saturday and in 7th Sunday in the Single-Speed Category, which earned him 26 more KBCXR points for the weekend for a season total of 51 points. Here are links to a photo "action sequence" of Pat in Sunday's race -- barreling down the hill, dismounting through the corner at speed, and running back up the dirt hill. 07 Oct 2012 - Second weekend of KBCXR cyclo-cross racing with the 360 Cup at Centennial Park, Lawrence, KS. Osceola Velo Club's Pat Schlager braved the cold, cloudy, blusterly conditions Saturday to finish 13th in the Single-Speed Category and was back at it on a much nicer, weather-wise, day Sunday for a 7th place finish in class. 15 KBCXR points for the weekend for a season total of 25. Way to keep racking up the points, Pat. Check out the photos of Saturday's cold race. And here are some photo links of Pat on a warmer Day 2, negotiating the tricky off-camber, loose-dirt, Turn 1, clipping back in, hurdling the uphill "baby" barriers, and, apparently, enjoying his race a little too much. 23 Sep 2012 - It's Cyclo-Cross season! 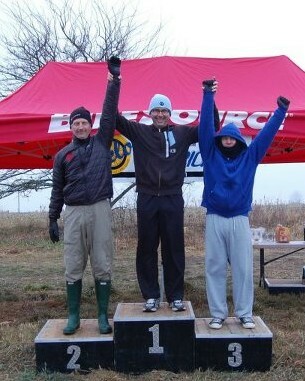 Osceola Velo Club's Pat Schlager raced both days at the Manion's 'Cross held in NW Wyandotte County, KS. Pat S. DNF'd in Saturday's race due to a mechanical, but bounced back Sunday to finish 8th in the Single-Speed Category. Pat's 8th place scored him 10 points in the season-long KBCXR (Kansas Best Cyclo-Cross Rider) competition. Here's a photo link of Pat grinding up the long climb and another of Pat walking the climb instead. 08 Jul 2012 - Osceola Velo Club's Pat Schlager was at it again at the 2012 Kansas Track Championships out at the Lawrence Grass Velodrome. Pat S. raced in four races today (500 M Time Trial, 1000 M Time Trial (the "Kilo"), Age Scratch Race, and Category Scratch Race) and managed to snag two medals (a Silver Medal in the 500 M TT and a Bronze in the Age Scratch Race). Here are some photo links of Pat on the 'Drome -- start of his Silver Medal ride in the 500 M, the Kilo, and Pat about to make his move for Bronze in the Age Scratch Race. 01 Jul 2012 - Osceola Velo Club's Pat Schlager raced in the 4th Annual Tour of Lawrence this weekend. Pat S. felt right at home racing in the 100+ deg Kansas weather (although, he could had done with a bit of humidity, thank you). Pat tried his hand in the Friday Night Street Sprints (200 M from a standing start, psuedo-drag-racing style) and in Sunday's Downtown Criterium (76th place in Men's Cat 4). (Pat took a break from the weekend's racing to volunteer at Saturday's KU Campus Circuit Race.) Here are links to a couple of photos of Pat at the Downtown Crit -- the elastic stretches...and it breaks. Pat S. hurdling the uphill "baby" barriers at the 360 Cup, Day 1. Pat S. at the Lawrence Grass Velodrome.